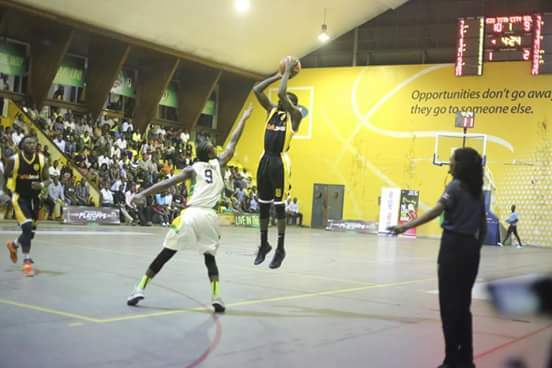 LUGOGO – City Oilers moved to with a victory of a record sixth consecutive finals apperance after victory over KIU Titans in game three of the playoffs semi finals on Tuesday night. Mandy Juruni’s side which has won the last five league titles defeated the Kansanga based side 73-67 to take a 2-1 lead in the best of five series. KIU who won game one started slowly, falling 14-21 in the first quarter but they staged an immediate come back with a 22-18 second quarter win to reduce the deficit to just four points at half time, 36-39. Oilers sensing that KIU could get back into the game, the five time defending champions produced a professional third quarter display to win it 18-16 and increase their lead to six points. However, KIU were not going to go down without a fight – In the latter stages of the last quarter, Denis Balungu scored 7 points including a three from downtown, Chris Omanye added four points from two drives as Titans closed down the gap to with in a point with just over a minute to play. Inside the last minute, Josh Johnson sank a three to put Oilers back into a four point lead but Joseph Chuma answered back with an easy jump shot for Titans. From a timeout, with 16 seconds on the clock and KIU Titans having the possession, Oilers’ Enabu made a quick steal from Michael Bwanga to launch a sole run before sealing the game with a lay up. The victory gives Oilers a 2-1 lead in the best of five series. Oilers will look to reach the finals with victory on September 21 in game four. James Okello contributed a team high 16 points four Oilers. Jimmy Enabu (14) and Stephen Omony (12) were the others in double figures for the defending champions. Oscar Muge top scored on the night with 17 points while his KIU teammate Chris Omanye managed 10. In the other game, UCU Lady Canons completed a sweep of KCCA Leopards with a game three 70-61 victory. Going into the game, UCU needed a victory to complete the business as the side were leading the best of five series 2-0. They had won 81-53 and 89-78 in game one and two respectively. Unlike the previous two games in the series, KCCA managed to put up a contest. The side trailed 14-13 in the first quarter but bounced back to win the second quarter 17-21. Leading by 3 points (31-34) going into the second half, KCCA started to crawl as UCU’s claws surfaced. The University team closed out KCCA’s guards before flourishing on the offense on their course to turn the deficit. Nicholas Natuhereza’s side won the third and last quarter 19-16 and 20-12 to seal the victory in style.